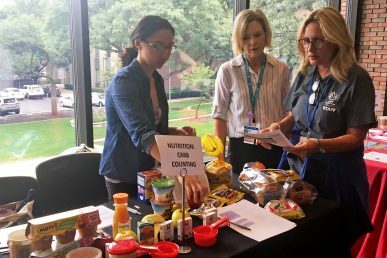 UIC senior in nutrition science Rachel Macam (left) and UI Health dietitian nutritionist Lisa Dempsey (center) talk with school nurses and health aides during the 7th annual Care of Kids with Diabetes Conference at UIC. About 270 nurses and dedicated health aides from elementary and secondary schools in Chicago and the suburbs attended the 7th annual Care of Students with Diabetes Conference Aug. 29 at UIC. The conference was hosted by UI Health’s pediatric endocrinology team. “This conference is about bringing people together to protect and support young students with diabetes,” said Marla Solomon, a registered dietitian and certified diabetes educator at UIC. During the conference, school health care professionals were provided education on diabetes and the needs of kids suffering from the condition. Training included sessions on the different types of diabetes, diabetes medication, nutrition and exercise, mental health and emerging patient care technologies. UIC began hosting the conference in 2012 following the passage of the Care of Students with Diabetes Act in 2010 by the Illinois General Assembly. The goal of the legislation “was to provide students with diabetes the opportunity to get an equal education,” Rep. Jim Durkin said in a letter to conference attendees. The legislation requires Illinois schools to have on-site staff trained in diabetes care. “This is not just any other training — it makes a world of difference to the many families that contact me every year,” Durkin wrote. To date, UIC is the only institution in Chicago offering this training. Seven UIC undergraduate and graduate students and many UIC staff and faculty members from across campus worked with Solomon to provide training and organize the conference.